6484 place | Vector illustration in rank M-rank: Creative conceptual vector set. Sketch hand drawn fruits vegetables pear cherry apple strawberry carrot tomato illustration, engraving, ink, line art, vector. Creative conceptual vector set. 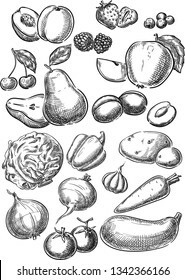 Sketch hand drawn fruits vegetables pear cherry apple strawberry carrot tomato illustration, engraving, ink, line art, vector.